(1) WONDER WOMAN FOREVER. At the San Diego Comic-Con the Postal Service announced “Wonder Woman’s 75th Anniversary to be Celebrated on Forever Stamps”. The first-day-of-issue dedication ceremony will take place October 7 at New York Comic-Con. This new issuance showcases four different stamp designs on a sheet of 20 stamps depicting Wonder Woman during four eras of comic book history: Golden Age (1941–55), Silver Age (1956–72), Bronze Age (1973–86) and Modern Age (1987–present). 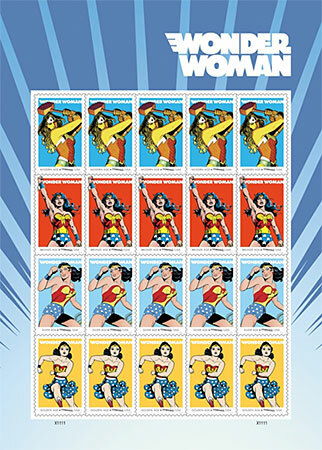 On the first row of stamps Wonder Woman of the Modern Age wields a hammer with a power and determination befitting her roots in the heroic world of Greek mythology. Art director Greg Breeding of Charlottesville, VA, designed the stamp pane. (2) SIGNATURE TRAITS. Max Florschutz continues his “Being A Better Writer” series of posts with “Giving Characters a Leitmotif”. ….Now, to some of you long-time readers, this may sound somewhat familiar. After all, we’ve spoken before of ways to show a reader character through dialogue choice or body language. Here and now, however, I’m sort of pulling all of this together into a single, overarching idea: What leitmotif have you given your character? What element of their personality, attribute of their view of the world, are you going to weave into their parts (or perhaps point of view) in order to let the reader know exactly who they’re following even before you give them a name? No joke. With strong enough characterization to a character’s perspective, it’s entirely possible to write a piece that, without ever mentioning a character’s name, is identifiable wholly as that character’s own. Through use of specific dialogue ticks, phrasing, complexity of language, or even things like catch phrases, general attitudes, or body language, you can inform a reader exactly who your character is. Better yet, such an action will, if varied (we’ll talk about that in a moment) bring the character to life. Because let’s be honest here: We all have a “leitmotif.” Each of us has very recognizable traits that allow others to see who we are quite quickly(an old friend of mine once—no joke—identified me in the dark, only from my silhouette, on the explained logic of “no one else walks with that much casual swagger” … and come to think of it, that’s happened more than once). Likewise, as you sit down to create—and then write—a character, what “leitmotifs” are you going to give them? What verbal cues, what methods of thought, or what reactions will they have. Will they be fight or flight? Will they be brusque to those they don’t know? Courteous? Do they think of themselves in first or second person when thinking? Now, I know this all sounds like character design and development stuff—and it is! But what I’m bringing to the front here is not just the act of deciding all this stuff, but of picking the ones that you’ll weave into everything about the character…. (3) BOIL ‘TIL DONE. The New York Times invites you to “Meet Luca, the Ancestor of All Living Things”. At least, that’s the theory. ….Luca, the Last Universal Common Ancestor, and is estimated to have lived some four billion years ago, when Earth was a mere 560 million years old…. ….Genes that do the same thing in a human and a mouse are generally related by common descent from an ancestral gene in the first mammal. So by comparing their sequence of DNA letters, genes can be arranged in evolutionary family trees, a property that enabled Dr. Martin and his colleagues to assign the six million genes to a much smaller number of gene families. Of these, only 355 met their criteria for having probably originated in Luca, the joint ancestor of bacteria and archaea. Genes are adapted to an organism’s environment. So Dr. Martin hoped that by pinpointing the genes likely to have been present in Luca, he would also get a glimpse of where and how Luca lived. “I was flabbergasted at the result, I couldn’t believe it,” he said. The 355 genes pointed quite precisely to an organism that lived in the conditions found in deep sea vents, the gassy, metal-laden, intensely hot plumes caused by seawater interacting with magma erupting through the ocean floor. …Dr. Sutherland, working from basic principles of chemistry, has found that ultraviolet light from the sun is an essential energy source to get the right reactions underway, and therefore that land-based pools, not the ocean, are the most likely environment in which life began. “We didn’t set out with a preferred scenario; we deduced the scenario from the chemistry,” he said, chiding Dr. Martin for not having done any chemical simulations to support the deep sea vent scenario. Dr. Martin’s portrait of Luca “is all very interesting, but it has nothing to do with the actual origin of life,” Dr. Sutherland said. (4) PRINCESS CHARMING. Roby and Kreider have turned to Kickstarter to get their next project out of the starting gate – Princess Charming: for a Few Princesses More. Josh Roby has been writing professionally for more than a decade (and writing unprofessionally for a long time before that), and has worked as an editor for curriculum development and a number of early reader titles. Nowadays, most of Josh’s time is spent as a home maker and raising two darling children. Anna Kreider is a writer, game designer, and illustrator who spends a lot of time blogging about depictions of women in pop culture. She is also attempting to raise a toddler, despite the toddler’s best efforts to the contrary. We started the Princess Charming book series to make children’s books that feature active, competent princess characters who do more than wait around to get rescued. We’ve already published six books across three different reading levels, but we’re far from done. Publishing the first six books was a great experience, and we’re ready to bring out the second batch, starting with Princess Rowan Charming. Only one thing slows down our Rowan — her friend, Prince Sundara, who insists on coming along. Something about Rowan having only one hand and that he has to protect her. But he only gets in the way! Somehow Rowan has to make the boy understand that he’s not cut out for adventuring… before he gets hurt. If we fund all of Princess Rowan’s titles, we’ve got two more princesses lined up and ready to go: Princess Chandra and Princess Nayeli are both penciled in for three books, which we will unlock as stretch goals. With a week to go, the appeal has raised $1,875 of its $3,000 goal. (5) SEVEN DEAD GODS. Westercon 67 alumnus Valynne Maetani has hit it big. Publishers Weekly has the story – “Two YA Authors Tweet Mutual Interests into Six-Figure Deal”. What began as a casual Twitter conversation between two long-time friends who for years talked about writing a book together – Valynne Maetani and Courtney Alameda – has become a hot property that recently was sold to HarperCollins in a two-book, six-figure deal after an auction earlier this year in which four major publishers participated. The final contract was signed in June. According to the two co-authors, it’s simply the inevitable culmination of their mutual passion for horror, anime, comic book culture, and Kurosawa’s classic Japanese epic movies. In Seven Dead Gods, which is set in modern-day Japan, 17-year-old Kira, who is the victim of bullying at her school, finds solace working in her grandfather’s Shinto shrine. After realizing that she can see and commune with demons, Kira – with her younger sister in tow – partners with seven “death gods,” or “Shinigami” in Japanese, to save Kyoto from destruction. July 26, 1969 — First Moon rock samples analyzed. (8) MONUMENT TO A HUGO BALLOT. Lurkertype finished voting for the Hugos and Retro-Hugos and celebrated by using the Pulp-O-Mizer mentioned in yesterday’s Scroll to make this faux pulp cover. (9) WILL JRRT FOLLOW GRRM ON HBO? That’s what iDigital Times would like to see: “’The Silmarillion’ TV Series: HBO Should Adapt ‘The Silmarillion’ After ‘Game of Thrones’”. The Silmarillion would be an incredible successor to Game of Thrones on HBO, not least because the two would be so different. The Silmarillion is firmly set in the epic vein, in the realm of the mythic; Game of Thrones is a story of kings and princes, but has always been down to earth, even in its new epic fantasy phase. The battles in The Silmarillion are more elemental; these are wars between Elves and dragons, Balrogs, giant spiders and endless hordes of orcs, and sometimes the gods themselves intervene. But the story itself is incredibly interesting—it has the depth and complexity to carry a series, even one that’s more directly fantastical than Game of Thrones. Could it happen? It’s not impossible. The Tolkien family still holds the film rights to The Silmarillion, and Christopher Tolkien has made it very clear that Peter Jackson isn’t getting those rights, not after the debacle of The Hobbit movies. But that doesn’t mean no one is getting them. HBO has shown itself a relatively careful steward of such properties, and it’s willing to invest in the money and talent to do such shows right. 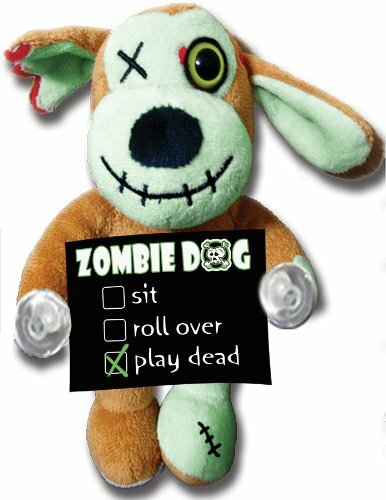 (11) NEEDS A CLUE. Spacefaring Kitten is “No-Awarding Editors and Avengers”. I don’t think that any of the novel editors does a bad job (ok, maybe one of them). This is strictly a protest vote against the insane category. How can anybody who is not an industry insider come to any conclusion about who is better than someone else in turning mediocre books into great ones? I have no clue. So when you have no clue, why cast a vote that in principal can obstruct others who don’t feel that way from giving an award? (12) ONE TRICK. Was there any question about this being the end times? (14) PIONEER OF UNIVERSAL SUFFRAGE. Sir Julius Vogel, for whom New Zealand’s national sf award is named, was remembered at a special memorial service in London at the beginning of the month, though not for reasons to do with his fantasy writing, which was never mentioned. Vogel had a visionary imagination. He wrote about air cruisers, driven by engines much like jet engines, the inventor of which was a young Jewish woman, niece of the spymaster. He envisages large irrigation schemes in the South Island, electricity as the prime source of domestic light and heat, hydro-electricity as a major source of power. In political developments, he foresaw a global federation of financial interests that maintained world peace, taxation as the great divisive issue threatening to break up the empire, and the resolution of the issue of Irish Home Rule. There is no limit to Vogel’s seemingly far-fetched ideas. What is interesting is that Vogel, who was reminded of his Jewish identity throughout his life, whom his political opponents described as the “wandering Jew”, whose newspaper, the Otago Daily Times, was referred to as “that despicable literary dish clout”, “the Jew’s Harp”, created a positive image of Jewishness in one of the leading characters of his work of fantasy. (15) A HUMMER. I must have missed this one the first time it came around in 2006.